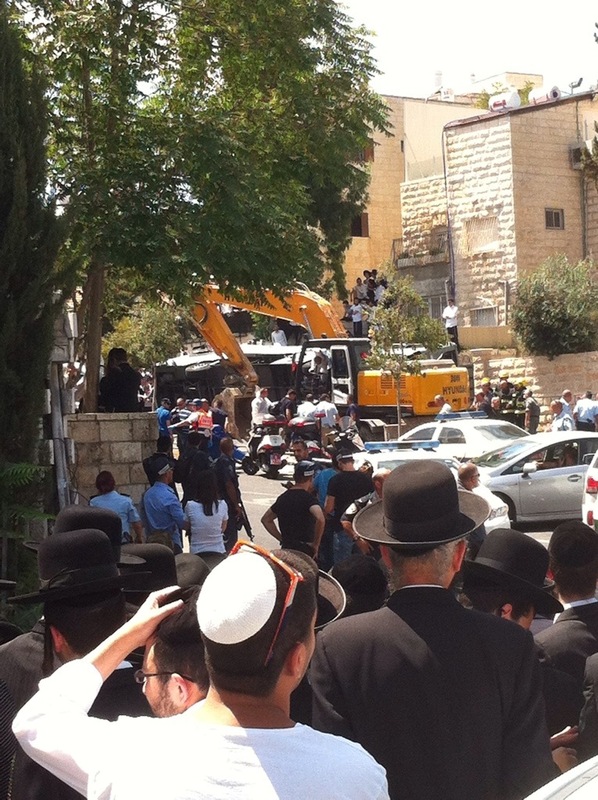 I start walking, and see a large crowd gathered on the Western side of Road 60, on the corner of the Haredi Shmuel HaNavih neighborhood. Traffic is stopped, there are a lot of police officers and soldiers and three times as many bystanders, milling about. The weather is really nice. It feels surreal. I get closer and see a bus, turned on its side. Next to it is a tractor with its windows either broken or shot out. The crowd is buzzing. I hear someone say to his friend, “they shot him before he could kill,” presumably referring to the driver of the tractor. Policemen are putting on body suits, next to a car labelled “criminological identification.” It feels strange and ugly. I decide to leave. I don’t need these memories. I don’t need to see the body. I walk a few hundred meters, where traffic is moving, and get on a bus. My phone buzzes again- Haaretz corrects its first report: one Israeli man, walking by, was run over and killed, and five others were injured. I feel like metal is pressing inwards on both of my temples, my throat feels tight and dry. More killed, ripped from this world, another holy name in this list approaching 2,000 names. I get three calls: from my partner and two friends who knew I was in the area. My phone doesn’t function right and the calls keep ending. Worried texts messages. Only then does it really sink in that I was a few minutes and meters away from all of this. I text back that I’m fine, physically, already in the center of town. Then it floods in along with everything and I want to cry or sit down or something, but I’m on a public bus, so I don’t.